This photo is a sweet potato vegetable carving that I tried this week, I used some lettuce and carved them into leaves just for plate presentation. It was my first time carving a sweet potato and it holds up very well! 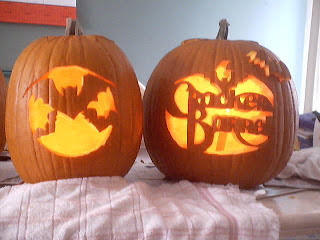 These photos are of the pumpkin I carved with my niece. I had her practice on paper what she wanted to draw on the pumpkin and then let her draw it on the pumpkin with crayon. 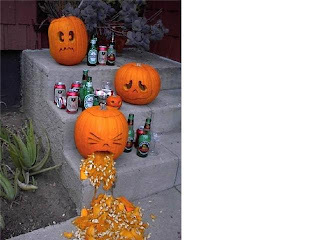 I evened out the mouth line (while she was not looking) and then moved the pumpkin saw in and out while she held on. I thought it turned out well and was thrilled with the outcome, although she did not like the part of taking the "icky" seeds out! This is a short fruit carving video on how to make a strawberry fan for an edible fruit decoration. This is a edible fruit arrangement I made, it has strawberries, grapes, oranges, pineapple, cantaloupe and honeydew. There is iceberg lettuce in the pot to give the skewers something to hold on to and covered with kale f0r appearance. 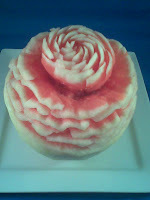 This is a round watermelon that I carved into a rose,this is also a Thai inspired fruit carving. You may notice that I removed the green outer skin of the watermelon but left the white of the rind to ad color contrast against the red of the fruit. Unfortunately, the photo was not taken with my camera and is of poor quality. This is a slideshow of different fruit carvings I have done! In this video I show you step by step how to make a rose out of a tomato, it is basic vegetable carving garish that is great for Valentine's Day, Anniversaries and romantic dinners!